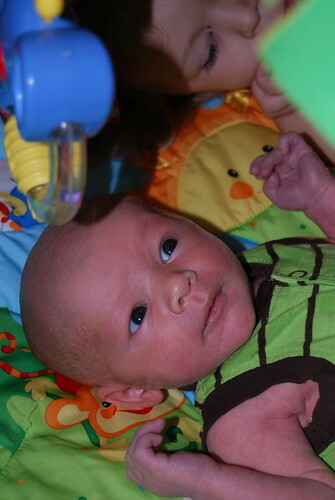 Hudson is two weeks old today and he's growing so fast. We've survived our first morning alone after dropping my mom off at the airport yesterday, and we even had a trip to the bank and grocery store! I didn't know what to expect with two children, but I think we're holding up fairly well. My mom was such a huge help to us these last few weeks so we'll see what reality looks like very soon! I'm soaking up every minute of Hudson being little since I don't know if we'll have any more babies. In all honesty, I wasn't really excited about being up all hours of the night or having a tiny newborn again, but I'm loving it. Hudson is so sweet and so far he's a dream. He just wakes up at night to eat and goes right back to sleep. I love to hold him-I hardly remember Landree being this small and she was almost 2 pounds and 2 inches shorter than him. Landree is doing really well with him. She is so sweet and gentle with him, and she loves to give him kisses and tickle him. 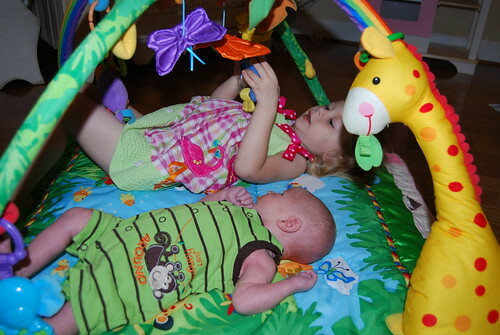 This morning we did our first 'tummy time' and Landree was so sweet to show Hudson exactly what to do. 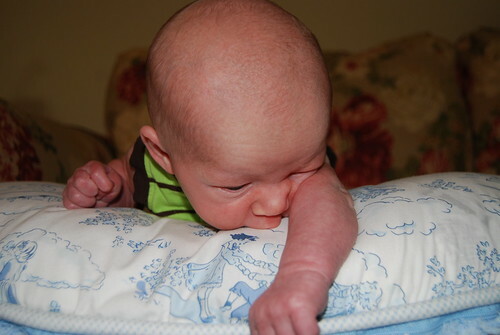 And this sweet little face-he's already changing so much! Congratulations!! He's such a cutie! I could just give Hudson a kiss through my computer screen! He is beautiful. I love that he looks so "boyish." There is no mistaking him for a girl. I love his sweet little nose. He is precious. 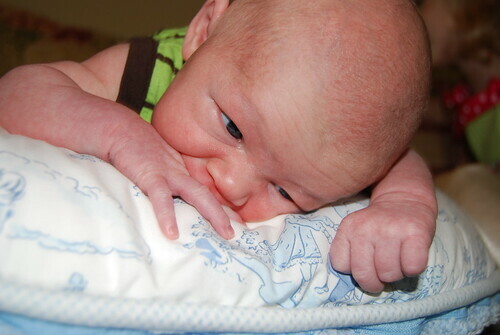 It makes me miss Carter being that little. He weighs 18 pounds now and there is nothing little about him anymore! Oh my gosh! I could just eat him up!!! There is nothing better than a brand spankin' new baby:) He's just perfect Jennifer! Glad to hear that you're adjusting well to two! They are so adorable laying on that mat together.....so sweet!! I can see how much he has changed already in two weeks! He is getting so big! What a cutie! He is so very cute, and I love seeing Landree with him! So glad to hear things are going well. Things are definitely busier with two kids! Enjoy every second of the baby stage! I have Baby Hudson on my shopping list this weekend! Jen, I don't think that you and I have ever met. I have met your mom and I am Tom's daughter. Aunt Angie led me to your site and I just wanted to say that your children are beautiful. We have a new one as well. she is 4 months old. It was nice to finally put a face to all of the wonderful things I hear about you. I must apologize. After reading a little more, I realize that Angie is your Mother in law (correct?) I apologize. You still have beautiful children. Your son is absolutely beautiful! Good thing, too, because otherwise that adorable Landree would always steal the show! I hope you're getting some rest and taking care of yourself. There's a lot less down time with two, so take advantage of offers of help when you have the chance. Oh they are just so precious together.....I love it! 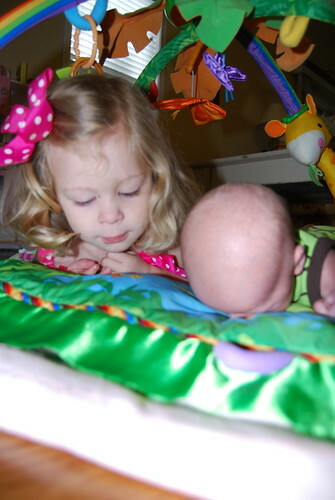 She is already an amazing big sister!